All transactions are safe and secure with a reliable history in online purchasing behind each of our associates. Buy the Miami Ink Kings Reasoning t-shirt to own Miami Ink clothing and merchandise. 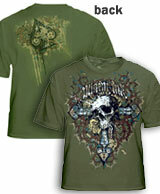 The design on the fronts of these olive green Miami Ink t-shirts includes a large skull with a cross behind it. The Miami Ink logo is displayed over the skull. The back features a tribal spade design near the shoulder. The 100% cotton tee is both comfortable and attractive. We can't promise that it will scare any birds away, but the unique design will surely turn a few heads. Wear this tee to have drinks at Love Hate, the bar that tattoo artists Ami James and Chris Nunez co-own together. In addition to the Miami Ink Kings Reasoning tee above, browse the Miami Ink Clothing Gallery for more apparel like men's and women's clothes, kids shirts or hoodies.